So proud of our local girl scouts for collecting items for BRAWS!! Their efforts even made it on the cover of today’s Fairfax County Times!! ​This holiday season, BRAWS Supporters, TRR Group, created a Tampon Tree to raise awareness about our organization's mission and invited the community to donate menstrual supplies. Many of our friends stopped by with donations totaling over 25K items! Read more about our tree ​HERE. BRAWS made the Vienna Voice! Thanks to the Town of Vienna and our Mayor Laurie DiRocco for their support as well as the Vienna, VA Woman's Club, Govan Real Estate Group and Tim & Julianna Chapman! Have you seen our dispensers in the Community Center or Town Green? BRAWS in the Washington Post! Thanks to Delegates Jennifer Barton Boysko, Kaye Kory. Debra Rodman and Mark Keam for all being so instrumental in the successful passing of the #tampontax bill in subcommittee today! And... to the grassroots activists out there... THANK YOU!!!! Your efforts DO MAKE A DIFFERENCE!!! Thank you Michael Chandler of the Washington Post for PERFECTLY capturing the essence of the menstrual movement in Virginia!! Thank you also to Jennifer Barton Boysko, Mark Keam and Kaye Kory for being such dedicated partners in this movement for change! We hope stories, such as this, will lead to a change in public policy that better reflects the needs of women and girls for many years to follow. Read the article HERE! OUR HEARTS ARE WITH HOUSTON! September 4, 2017-BRAWS spent the Labor Day weekend collecting donations to send to women and girls impacted by Hurricane Harvey. "Seeing all the women and girls that were stranded in shelters, displaced from their homes, we had to help." says Executive Director, Holly Seibold. Thank you Suzanne Kennedy and ABC 7 News- WJLA Good Morning Washington for featuring BRAWS during their 6, 7, and 8 am hours! Thanks also to our volunteers and our wonderful community who came out to donate! Read more HERE. BRAWS ON THE FRONT PAGE OF THE WASHINGTON POST! 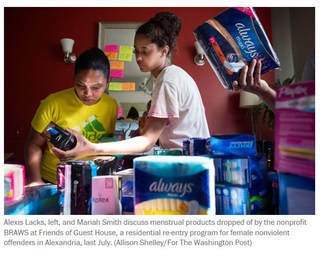 BRAWS was recently featured in the August 8, 2017 edition of The Washington Post along with Holly Seibold, Executive Director and Founder, in a front-page article entitled “Free Access to Tampons Gains Political Traction” by Michael Alison Chandler. Chandler writes "A topic that for so long was rarely discussed above a whisper has recently been taken up by growing numbers of lawmakers. Spurred by grass-roots activism aimed at lifting the stigma surrounding menstruation, the lawmakers are proposing measures to provide broad access to menstrual products for women. Their efforts include exempting tampons and pads from state and local taxes, compelling prisons to stop charging inmates for the supplies and making them available for free at public schools and workplaces". Holly stated, “This is such a critical topic, we are so excited to see The Washington Post give it the spotlight it deserves as we continue to fight for the dignity of all women and girls.” READ MORE HERE! 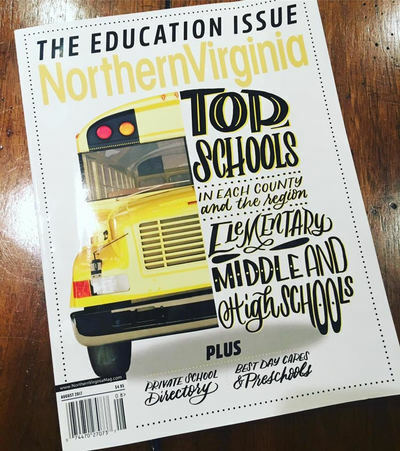 BRAWS in the Northern Virginia Magazine! 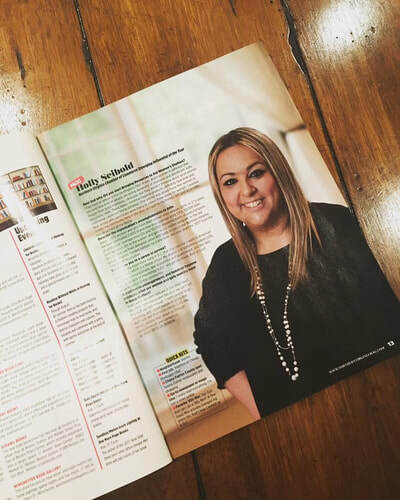 We are so proud that BRAWS and our Founder, Holly Seibold, are featured in Northern Virginia Magazine's August issue! Thank you @elizaberton for recognizing our work in the #NOVA Community! Thank you Delegate Ken Plum for featuring us on your show Virginia Report! Check it out on Reston Ch. 28 Comcast or watch it here. Check Out BRAWS on NBC! Thank you to Catherine S. Read for featuring BRAWS on "Your Need to Know!" on July 2nd! We are honored to be given the opportunity to share our story! Read Catherine's article here or watch the video below! More of BRAWS in the Media!